When he played the central villain in Avatar, Stephen Lang had a pretty cool look. His costume showed off his strong arm muscles, his haircut screamed "marine" and the scars on the side of his head suggested that he was both experienced and dangerous. Now he's all set to play the villain again in Marcus Nispel's Conan The Barbarian, but this time around his costume is just plain awful. 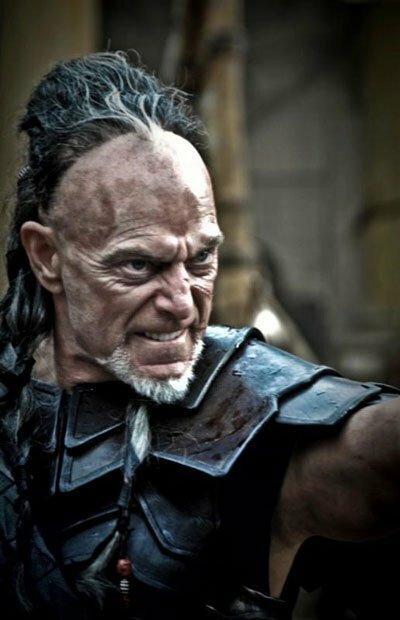 Newsarama has gotten their hands on the first image of the Khalar Zym from the new film and I will say that it looks okay below the neck and Lang looks appropriately angry, but what the hell is up with that hair? Not only is it an obvious wig, but the forehead space and all of the ridges make him look like a Klingon. Perhaps it will look better when it's in motion, but I sincerely doubt it. Check out the image below and head over to Newsarama to see it full size.